Journalistic integrity has finally gone the way of the dodo. Allow me to share one true story with you ( don't worry, this will likely be the only true story to be found on this site ). Back in the olden days, when television was black & white or fuzzily colored, before cable TV or the internet, "journalistic integrity" meant something. There were only a few TV stations and fewer newspapers per community and "journalistic integrity" was the watchword. Editors made sure the news stories had merit, and were not twisted or lacking solid information. With the advent of cable TV and the "900 channels & nothing to watch" scene, broadcast news started deteriorating from offering good solid news stories to "if it bleeds, it leads" type schlock. You see, the average viewer now had more programming vying for their attention, so "shock" and "drama" started emerging as the baseline for TV news stories. During this time, the newspaper industry looked on . . . The internet came along, and with it Youtube & its thousand of peers, social networking, blogs and other information exchange vectors. Now, not only was the TV industry ( both broadcast & cable ) further diminished, but the newspaper industry was fighting for its place in the news pantheon. Social networking began replacing traditional news outlets, driving both TV & newspapers out of business or worse - into horrible caricatures of their former status. Nowadays in the fight for your attention, both TV & newspapers print any old stuff they think will be attractive without fact checking or any sort of editorial oversight. Some media outlets even make up their own "news", based on the most gossamer of rumors. 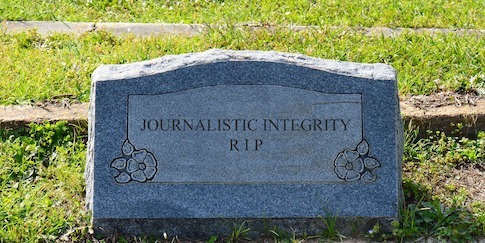 "Journalist integrity" is dead and I believe I can make up better "news'. I am Kasten von Schrödinger. Welcome to Bull Speak.